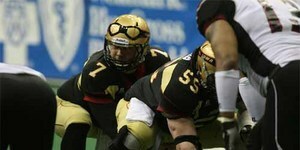 04/30/2010 2:17 PM - The Iowa Barnstormers turned in their finest all-around performance of the season Friday night, returning home from Orlando with a 50-40 victory over the Predators in hand. Iowa jumped out to a quick 7-0 lead when DB Tanner Varner intercepted Orlando QB Nick Hill at the 7 yard line and returned it for a score. The Barnstormers had at least a share of the lead for the rest of the contest. Once again, QB Ryan Vena was a top performer, completing 22 of 34 passes for 243 yards and 3 TD. Wide Receivers Jesse Schmidt and Todd Blythe each had numerous big catches and Kicker Jeff Glas sealed the victory with a 28 yard field goal in the games' final minute.